Polar has an impressive fitness tracking heritage. It's been a go-to brand for elite athletes and serious sports types for decades. Two years ago, when it took all that experience and put it into its first activity tracker, the Polar Loop, we were relatively impressed. Now it's back. And it's got new tricks. 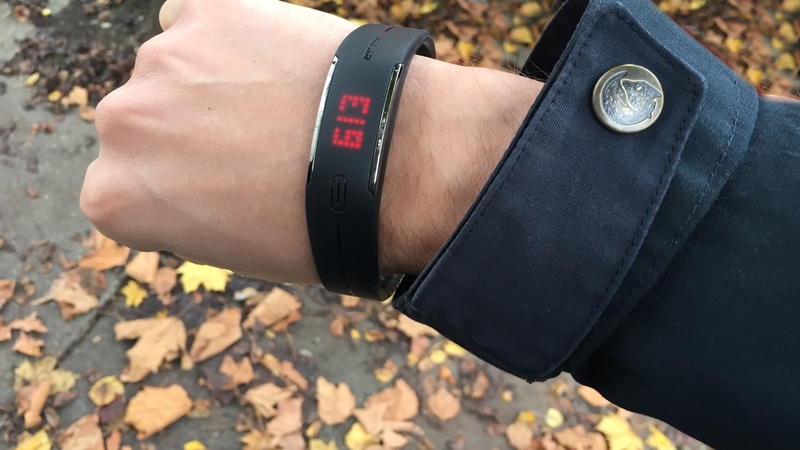 The Polar Loop 2 has moved on from just measuring steps and calories. It's had to in order to survive. The fight for the space on your wrist has intensified and upgrades from the likes of Jawbone, Fitbit and, of course Garmin, alongside the arrival Apple Watch and ever better Android Wear devices, means Polar needed to bring more to the table. Polar picks: What is the best Polar watch? Its response is definitely evolution not revolution, (they've clearly been busy working on other new devices like the Polar A360). And with a limited display and no GPS does the Loop 2 offer enough to compete and command its $$119.95 price tag? The Loop 2 has retained that somewhat old school, retro design we saw with the original Loop. That means it still won't be everyone's cuppa. Colour-wise there's a choice of sorbet pink, white and black, or for those who like a little more bling there's even a limited edition Swarovski encrusted white version. There are some subtle changes. A thinner clasp, the removal of some grooves on in the inside of the strap but it still has a more plastic feeling than some of the soft silicone counterparts. For our money though, it's still one of the more stylish activity trackers out there. The Polar's 85 red LED display is edged with a touch of stainless steel to provide some retro appeal. While some people might prefer a bigger LCD display on their fitness tracker, the Polar makes use of its screen well, managing to deliver just the right amount of easy to read stats and updates. It's pleasing to see they've kept the simplicity that we liked in the first generation. There's no change to the controls on the new Loop either. The single capacitive button is still used to scroll through the various data screens. The use of a virtual 'touch' button rather than a physical key means there's no unsightly lumps or bumps breaking up the smooth look of the Loop. However, just like we found with the first Loop, we were unimpressed by the responsiveness, and were often frustrated by it taking two or three attempts to register a press, and unfortunately, that's not the only bugbear. Another thing we hated from the original Loop that's still an issue here, is the chore of sizing your Loop 2 when it's first out of the box. The band has to be cut, using a wrist sizing tape and scissors. Some crafty types might enjoy this mini project and it's not the hardest thing in the world to do - and it does make sure you get a good fit - but it's a bit fiddly and the pressure is palpable when you make that cut. We couldn't help feeling the fear that one snip in the wrong place would render our Loop useless. On the plus side, the Loop 2 is still at the lighter end of the fitness tracker spectrum at just 38g. At times that lack of weight can add to the feeling that it's a little cheaply made - something the fiddly clasp doesn't really help with - but in our tests we've found it to be nicely robust. It's a bonus that it's comfortable enough to forget you're wearing it but also able to take a knock or two, essential in a product you're going to wear 24-7. Speaking of which, the entire unit is waterproof to 20m too so it doesn't need to be taken off in the shower or when you jump in the pool. That's great for maintaining consistent usage. Anyone who's ever owned a tracker will tell you that taking it off and forgetting it, is one of the biggest reasons to eventually stop using a tracker. On the features front you still get all the steps, distance, activity and calorie stats presented in a pleasingly simple set of numbers on the band's screen. While automatic sleep tracking stats are recorded and fired to the partner Polar Flow smartphone app. There's also a new vibrating alert that kicks you into action if you've been sedentary for 55 minutes. This is really Polar playing catch up (the first Nike Fuelband had this) and it's a shame you can't adjust this to create more targeted personal movement goals. The new built-in vibration motor also powers arguably the major upgrade from the original Polar Loop - notifications. The band now also acts as a smart notification centre for a connected iOS or Android phone. You can choose between a visual preview with vibrate, or on without preview for just vibrate, or off. For incoming messages, the word MESSAGES flashes on the screen, while upcoming calendar events also show, with CALENDAR emblazoning the LEDs. Somewhat amusingly the screen can only fit around four or five characters at a time and so when a message comes in you actually see 'MESSI'. One for the Barcelona fans, then. The Loop 2 tracks steps, calories burned, distance and also sleep. Your distance measures are taken from movement sensors and offer an approximation of your steps and distance covered. What you're getting here is a benchmark of how active you've been, how many steps you've taken and not 100 per cent accurate daily read out. This is the case with pretty much all fitness trackers and the Loop 2 isn't any different. It's a good tool to see if you've been more active than you were yesterday, last week or last month. Meanwhile the so-called Smart Calories are worked out using your personal information like weight, height, age, gender and the intensity of activity. The Loop 2 also works with a heart rate monitor for even more detailed data. Goals are important for the Loop 2. It breaks these up into intensity levels to make them more understandable and achievable but you'll need to fire up the Flow app to get into the detail. There's resting, sitting, low, medium and high activity. The more active the state the wearer is in the more points they get and the closer they get to their daily activity goal. You still get the handy little updates that tell you how much of a certain kind of activity you need to do to hit your daily goal, for example 40mins Jog, 50 mins Walk. It' a nice motivational touch carried over from the Loop. When you pair the Loop with a heart rate chest strap and the Polar Flow smartphone app you get access to Polar's suite of Smart Coaching features. For example, during training you can get your heart rate read outs on your wrist. What's more you can also get instant post-workout training benefit feedback provided you've been using a heart rate tracker. While we're not talking ground-breaking bespoke coaching advice here, it's a great to get this little bit of feedback when you've just jumped off a treadmill or killed yourself in a spin class. At night the Loop 2 is small enough to be worn fairly comfortably and will track the your sleep patterns based on your movements during the night. We loved the fact that this works automatically so you don't have to remember to switch modes when you climb into bed. Sleep patterns are analysed using the Polar Flow app rather than on the band itself, breaking your night down into Restful and Restless Sleep while also giving you an overall sleep total. We found the overall sleep duration to be fairly accurate but the breakdown of restless to restful a little more sketchy. We know for instance that during one night of our tests, we were up in the night tending to a four month old baby several times but this didn't seem to register as restlessness. To be fair to Polar, we've struggled to find a sleep tracker that does this well and it's not really a deal breaker for the device. The new vibrating motor also comes into play here, acting as a smart alarm. This will wake the wearer at a light point of sleep rather than letting them slip back into a deeper sleep. The result should be a fresher start to the day and overall better sleep. The vibrating smart alarm, that works with the sleep tracking, is a brilliant addition which really adds value to that price. The fact it'll also work with a heart rate monitor could be appealing to some, although at that price an activity tracker with optical HR tracker may appeal more to some. The Polar Flow app has been around for a while. It was built to work with the company's more sport-focused GPS and heart rate featuring wearables but now incorporates your Polar Loop data too. The result is a well-built app that is not only simple to use but offers a clear top line readout which can easily be dug into for nitty gritty data, for those who want to be a bit more hands on. Polar Flow also hosts a community of users and while it lacks some of the richer features you get on Garmin Connect, features like the ability to look at a map to see other people's training sessions and make comments can be a great motivator. Polar says the Loop 2 will last up to eight days on a charge using its 38mAh battery. A full charge from flat takes around 90 minutes, although we found a half an hour top up to be more than sufficient in most cases. Of course battery life depends on usage. The eight day's includes an hour of training per day but if you're running daily, tracking sleep and using it to offer constant vibration alerts for smartphone notifications that longevity definitely takes a hit. But even with heavy use we found you can still expect to get a good five-day week at the very least before needing to connect it to the charger. The Loop 2 charges using the same proprietary magnetised charging cable as the original Loop. There's something nicely Apple about the way the cable docks with the band but unfortunately it does have a habit of coming unclipped if you're not careful about how you place it. Plus you've got to carry that cable with you on holiday. It’s hard to escape the feeling that the Loop 2 is simply the original Loop with a firmware update. The addition of smartphone notifications and vibrating inactivity alerts are a nice touch but they’re hardly groundbreaking. This isn’t a revolution in fitness tracking. But to be fair to Polar, some people crave simplicity and for the price this is a solid piece of activity tracking kit that does a lot of the basics well. If you own a Polar Loop, don’t upgrade. If you’re a newcomer to the fitness tracking world then, bang for buck, the Loop 2 is one of the best out there. If you’re a runner who wants to track activity you’re better off investing in a Polar M400.